Remove spinach from pouch; place in colander. Rinse with warm water until thawed; drain well. Squeeze spinach dry with paper towel. Meanwhile, in small bowl, mix sour cream, basil, tomatoes, salt, lemon juice and garlic. On each tortilla, spread 1 tablespoon sour cream mixture. 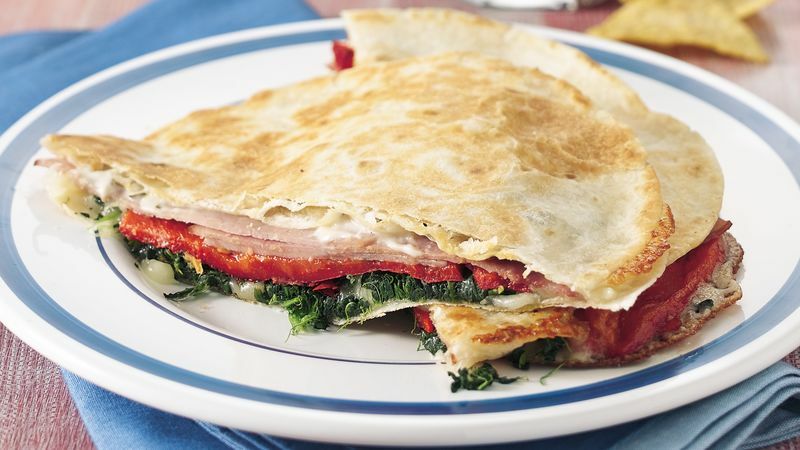 Top 4 tortillas evenly with ham, roasted peppers, spinach and cheese. Cover with remaining tortillas, sour cream mixture down. Spray griddle or 12-inch skillet with cooking spray; heat over medium heat. Cook 2 sandwiches at a time 2 to 3 minutes on each side or until golden brown and thoroughly heated. Cut each sandwich in half to serve. Serve with your favorite soup or salad, if desired.